David Swift: Earlier this year I went to an art exhibition at Observatory Hill in Sydney and saw this amazing sculpture on the wall. After a few phone calls and a bit of bribery I managed to set up a photo of the sculptor. 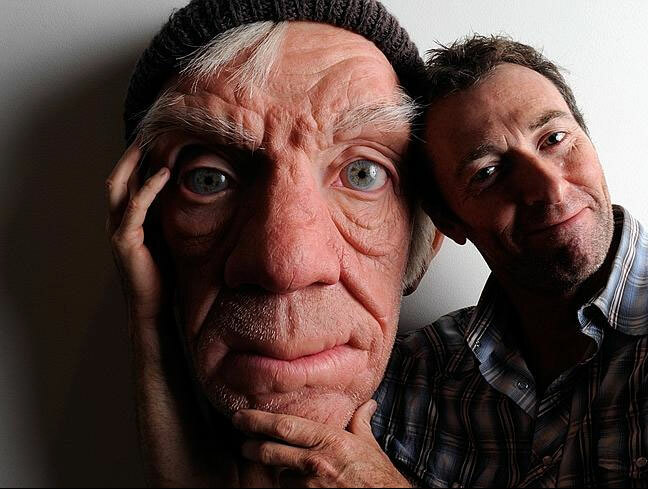 The artist is Bondi local, Paul Trefry who has worked as a special effects artist on several big budget movies. Paul never met the man that owns the face, it was based entirely on a photograph of a homeless man. It was first sculpted in clay and then a rubbery mould was created and painted. Several types of hair were used including yak hair and horse hair and to get the right look, thousands of strands were individually inserted into the face.